There are many things to do in Venice besides take a gondola ride. The whole pensolon (municipality) of Venice is divided into 6 boroughs: Cannaregio, Castello, Dorsoduro, San Marco, San Polo, and Santa Croce. All have charming places to visit and delicious eats and drinks. Honestly, you would need to a nice chunk of time to check it all off of your list, we’ve been twice and haven’t even scratched the surface of the city. We hope you find a few things to do in Venice that break away from the traditional tourist haunts. (Don’t worry though the things are great for a reason). Here are some attractions and activities that make up the best things to do in Venice. The public water taxis are a hard sell when it comes to Venice ambiance. It is most certainly not a cheap experience, but Venice is an amazing sight to take in by water. It’s also a much better value than a gondola as prices are pretty comparable and you cover a lot more water in a speedboat. The higher end private water taxis will even include sparkling wine and snacks, but you’ll have to pay around €125 an hour. We love to visit Venice in the offseason, and anyone in the travel know avoids the summer months throughout Europe. However, there is one other busy period where it’s worth the crowds. That is in February when the city celebrates Carnival. 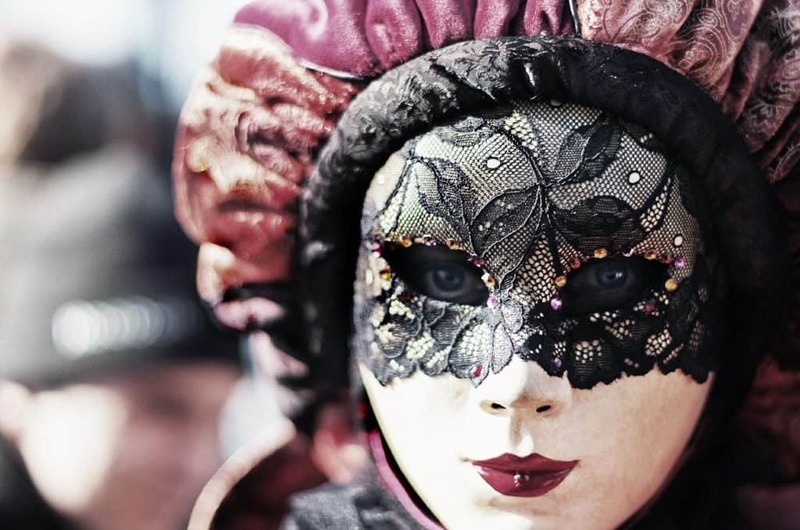 Nearly three million people dress in masquerade costumes and head to balls around the city. 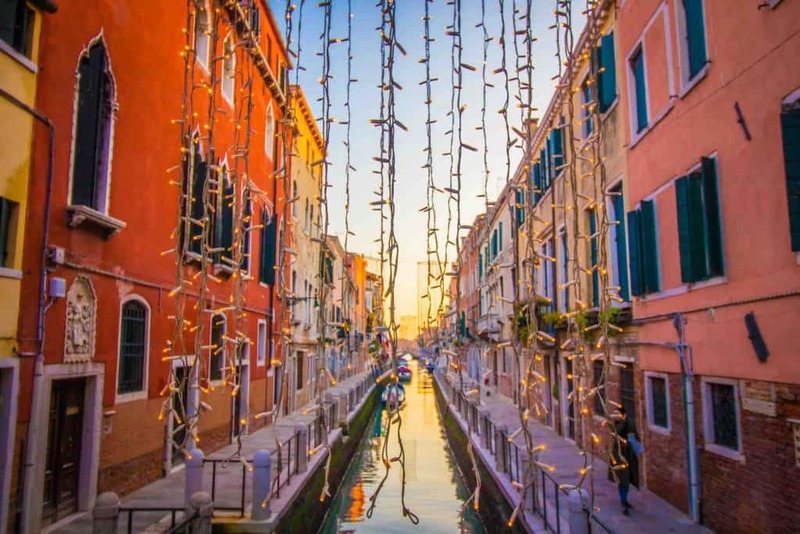 The festivities date back to the Renaissance when Venetians would wear gilded masks, feathered hats, black capes, and gowns. 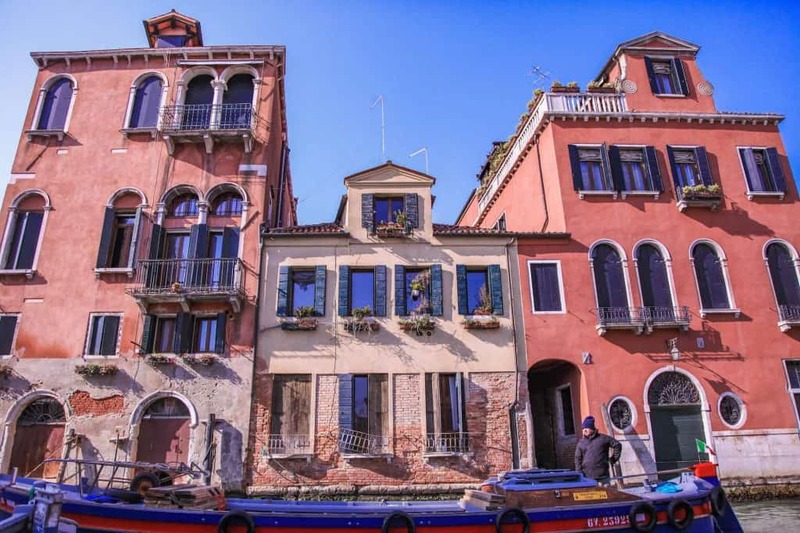 The residential neighborhoods of Venice are where the city shines it’s brightest in our eyes. Once you pry away from the busier areas of San Marco, Cannaregio, and San Polo you’ll find the neighborhoods of Castello and Dorsoduro. In a city that can feel crowded at any time of year you finally get the chance to breathe in the neighborhoods. That’s why they are our absolute favorite areas of Venice. It’s best just to wander as you’ll find quiet canals, laundry air drying, food markets, and small independent shops. We even found ourselves exploring an old hardware shop full of brass fixtures from the city’s past one day. There are plenty of places to catch a view of Venice, but none are as grand as the view from the Campanile. From the top of the famed bell tower next to the St Mark’s Basilica, you can see all of Venice unfold. Don’t worry about having to take the steps as there is an elevator in the interior that takes you to the top. The tower is 98.6 meters (323 ft) tall and the tower dates back to the 9th century when the original was constructed on Roman foundations. It went under several restorations and works until it took its present shape in 1514. However, the current tower is from 1912 after the original tower collapsed. It’s well worth journey via water bus to the island of San Giorgio. The church located on the island happens to be one of the few in Venice that does not charge an entrance fee. Inside the church, you can find a number of Renaissance paintings by Tintoretto. The Venetian painter is an iconic part of the city and his works can be found throughout the city including St Mark’s and the Doge Palace. You can find his grave in Madonna dell’Orto in Venice. Asides from Tintoretto’s paintings the church offers amazing views of Venice and St Mark’s Square from across the water with none of the crowds. The iconic Basilica Santa Maria della Salute has been seen all around the world in countless photographs and movies. It’s a baroque church that was constructed in the 17th century on the Grand Canal. That location places it smack dab in just about every photograph of Venice, including the opening one of this article. The church is made of beautiful white Istrian stone and it’s decorated by more than 100 unique statues. It’s all worth approaching the church and enjoying the impressive facade and scale. The church was originally designed to commemorate Venice escaping the throws of the black plague and has since gone on to become an institution in the city. It houses notable works form Tintoretto and Titan. As former New Yorkers, we’re familiar with the Guggenheim in the New York. However, most people don’t know there is a lesser-known Guggenheim museum in Venice. Peggy Guggenheim was the daughter of Benjamin Guggenheim and niece of Solomon R. Guggenheim the American mining tycoon. She was an avid art collector and lived in Venice for nearly 30 years. Most notably she was is credited as one of Jackson Pollock’s most fervent supporters and the reason he became an art sensation. In fact, the artist has an entire room in the museum. Tickets cost €14 and are well worth some wonderful pieces of modern artwork. After her death, her collection passed on to the larger Guggenheim art foundation and now a rotation of new exhibits goes on display regularly. Architecture, art, and history abound in Venice. It’s everywhere to the point where you can not escape it. While it’s easy to let your head get lost in the clouds staring at all of the architecture and art-adorned walls don’t forget to look down. Some of Venice’s most beautiful elements lie in the mosaics and tile work in her palaces, streets, and shops. In one of my favorite pieces on travel ever this German photographer explores the floors of Venice, read it here. While in New York Natasha and I were a rare exception of millennials and frequented the Metropolitan Opera on a number of occasions. Ever since then we’ve fallen in love with the Operas of the world and jump at the chance to attend one when we can. You would be hard pressed to find many places better to attend an opera than La Fenice. It’s a gorgeous theatre covered in velvet, gilded fixtures, and sparkling chandeliers. The interior with its rows of box seats is everything you’ve ever imagined a grand theatre. Be prepared for a night of finery, history, and world-class talent. 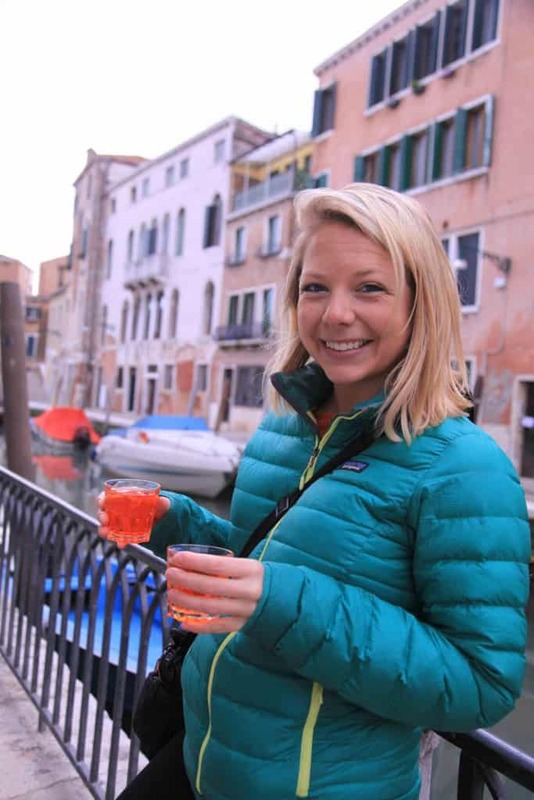 It’s hard to consider this a thing to do in Venice, but Burano is a wonderful day trip from Venice. 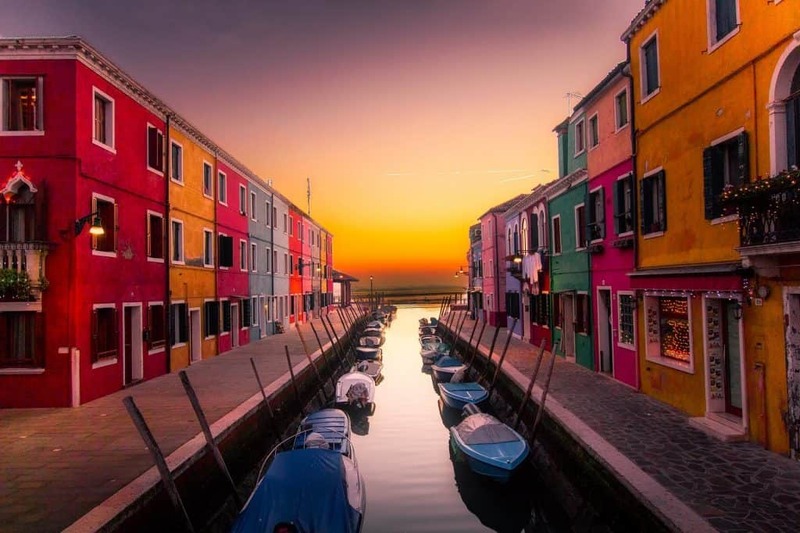 Homes on the island of Burano are painted in a myriad of colors and it’s likely you’ve seen the charming town in postcards and magazines before. 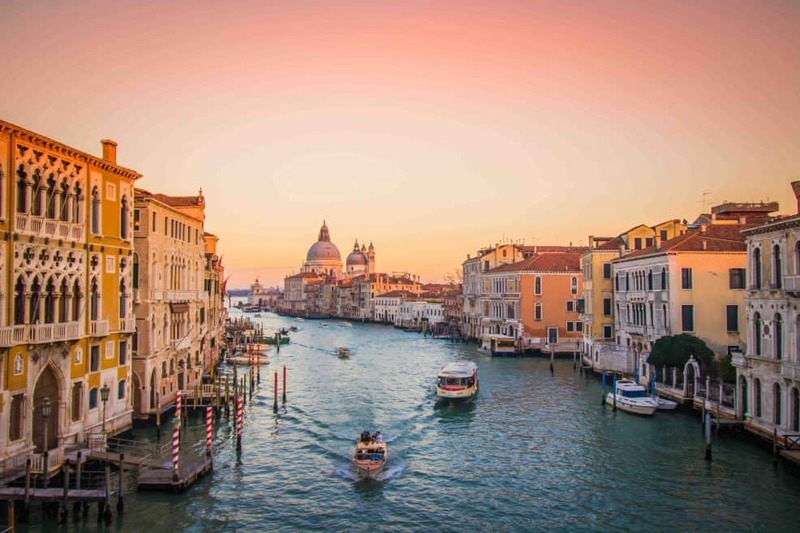 While on the island enjoy some fresh seafood, risotto, or pasta before heading back to Venice, preferably around sunset so you catch it on the water. Head to Via Garibaldi which is Venice’s widest street. It’s actually a former canal that has since been filled and is now lined with bars, restaurants, and shops. The added space makes the street feel more at home in a small provincial Italian town rather than Venice. On weekday mornings there’s an outdoor market where local vendors sell fresh vegetables, fruit, cheese, and fish. No trip to Venice is complete without a visit to Piazza San Marco. 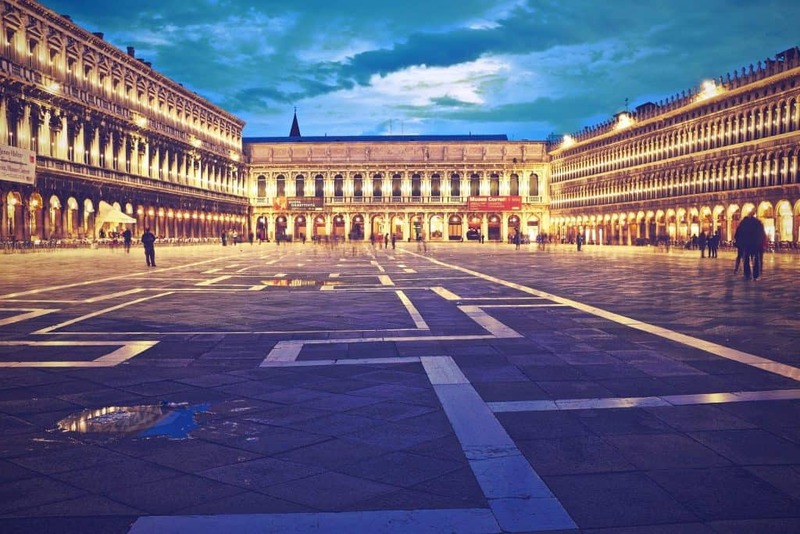 This is the main public square in Venice and boasts stunning architecture from the Byzantine era. It is the center of Venice and the must-see attraction for every visitor to the city. It’s honestly one of the most iconic locations in the world. Try to visit the square at night when all of the day visitors have left Venice and the restaurants have closed leaving it empty. Watching the lights twinkle throughout the square is one of my favorite things to do in Venice at night. If you want to learn about fine fabric manufactured in Venice for centuries Venice Lace Museum is your calling. The museum has an extensive history of lace making that dates all the way back to the medieval times. Leonardo da Vinci even bought lace for the main altar of Duomo di Milano here. Keep an eye out for the Church of San Martino that has a leaning campanile. Venice is a city of bridges and has nearly 400 that connect the cities islands. 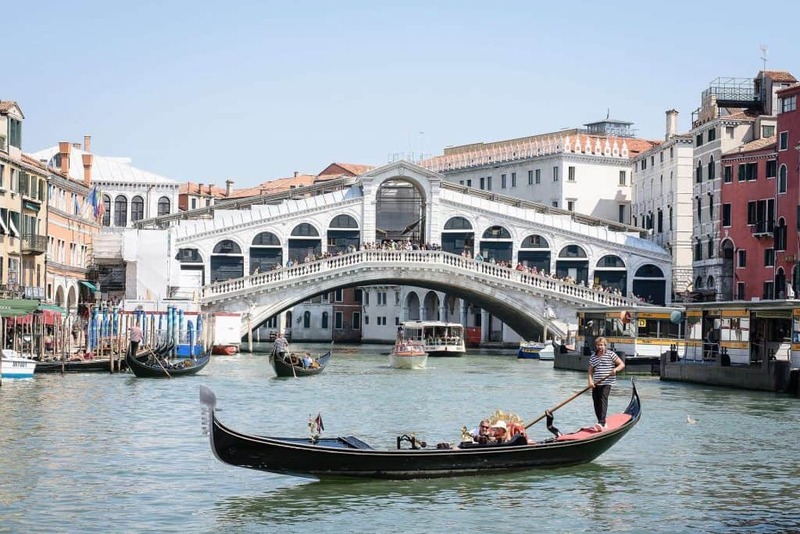 Of course the most famous happens to be Ponte Di Rialto, or Rialto Bridge. 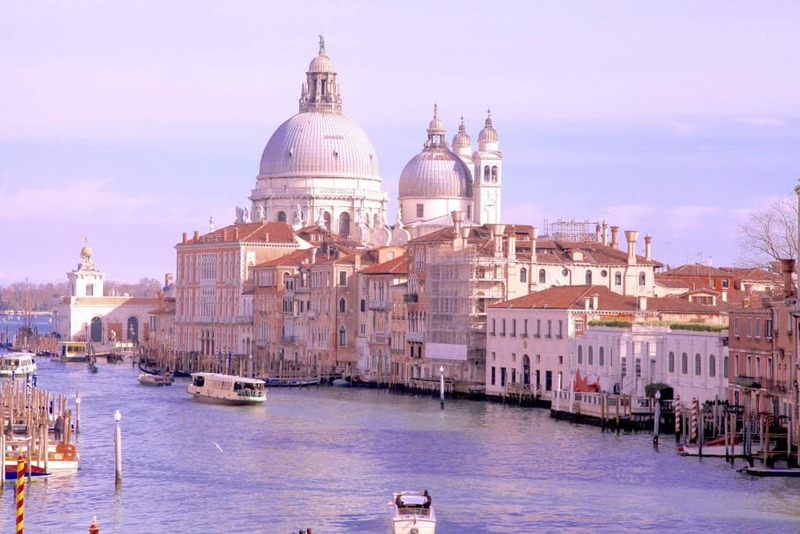 It was constructed in 1588 and offers amazing views of the Grand Canal. The bridge that connects the districts of San Marco and San Polo offers some of the best canal views in the city (although there are no bad ones really). Most impressive are the large boutiques and jewelers that line the grand staircase. The doges of Venice were elected officials by their peers. After which their lives we’re owned by the state. They lived in a lavish palace but were unable to own any property foreign or domestic. There is no better place to get a better understanding of the former Venetian state than the Doge’s Palace. You’ll find a countless number of Renaissance paintings, rooms, expansive halls, and narrow chambers. The palace served as the administrative hub of the Republic of Venice as for nearly a millennium the Venetians controlled the Mediterranean waterways. While exploring the palace take a walk across the famed Bridge of Sighs where you’ll hundreds of tourists snapping photos when you peer out the window. Get your ticket here! This hidden bookshop/library was a unique find for us. It is off the beaten tourist path and tucked away in the Castello District. Many hours can easily be spent finding new and used books. Inside the used bookstore you’ll find stacks of old books, magazines, and cartoons. 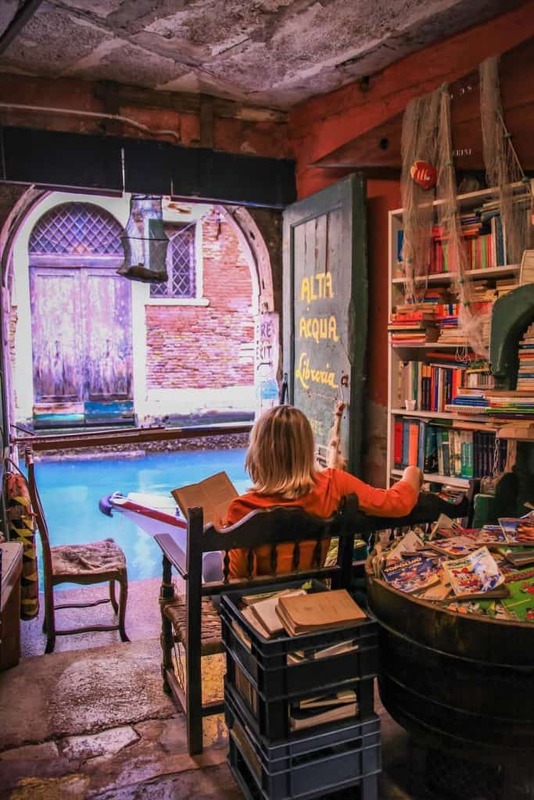 Old gondolas have been dragged into the bookstore and repurposed as books, I suppose it’s to help combat the Venice floods. Mask shops pretty much rule the streets of Venice, but most of these are cheaply imported masks marketing to tourist. Ca’Macana is a fabulous genuine mask shop in Venice that actually make all their own products. You can even find masks used in Stanley Kubrick’s Eyes Wide Shut here, as this is where they were made. The nice shop owners allowed us to have a lot of fun by letting us try all the masks on. This is said to be the oldest coffee shop in the world. 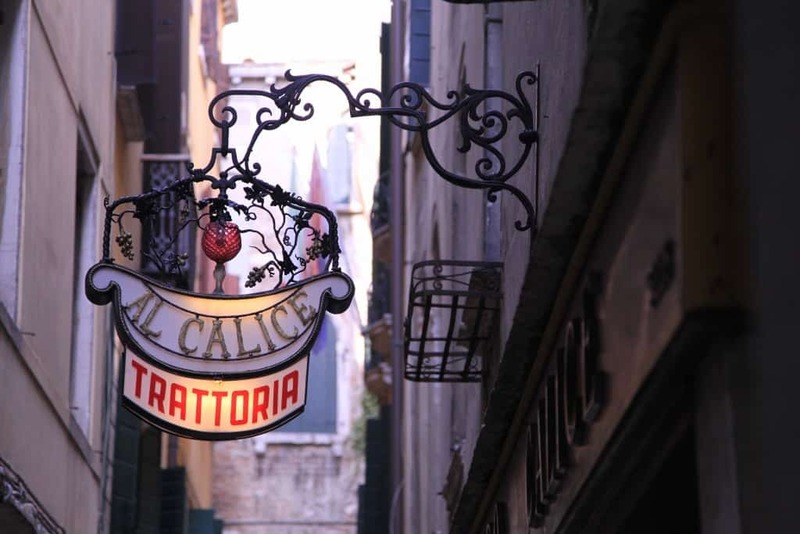 Cafe Florian is set in the heart of San Marco Square and has been in operation since 1720. Over the centuries it has attracted celebrities, artists, writers, and even royalty. Over time the interior has remained largely unchanged and it feels like a time capsule. They’re well known for their sweets and coffee. During the summer the patio is the place in Venice to relax and listen to live music in the sun. We’ve stopped in the cafe twice now and could not stomach the €12.50 a cappuccino price. Just to note, a Cappuccino in Italy should cost €1.50, but in Venice, it’s a struggle to pay €2.50. Wondering how to order an espresso? Read our coffee guide to Italy. This restaurant is tucked away, but it’s worth the effort to find it. It’s a hip restaurant serving modern dishes in a candlelit modern atmosphere. Unlike many fine dining restaurants in Venice, there is no tablecloth here or stuffy feelings. It’s wonderful food and wine at a price that won’t break the bank. They have a number of creative dishes and a nice selection for vegetarians. Don’t worry about the wine they have plenty! Perfect local wine and cicchetti shop. The place is tiny and there are no seats inside but the wine is flavorful (and cheap) and cicchetti makes for a midday snack. You’ll find a smattering of patrons sipping wine and eating outside this corner shop. Be strategic in your timing as the shop, like many great things in Venice can draw a crowd. We popped into this little Trattoria the last time we were in Venice with my family and had a fantastic meal. It’s good Italian food at an affordable price. We were able to find great vegetarian food and delicious seafood linguine. It’s a cozy little trattoria, but I’ve since read reviews and it looks like the secret has gotten out. You may need a reservation or face a long line in the high season. These are two great options for cicchetti and they’re neighbors. 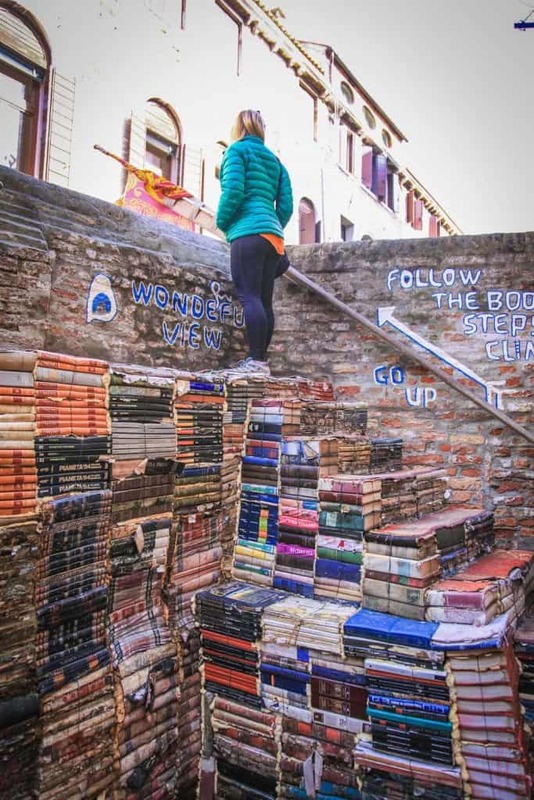 It takes a bit of journey from the center of Venice as they’re located deep in Dorsoduro. However, if you make the journey you end with cheap cicchetti, wine, and spritz. All of this unfolds in the street and you can mix and match here as the different cicchetti options are endless. Small shop but there is enough room to sit inside or at the bar. A perfect option for mouthwatering Gelato with a great view. Located around the corner from Osteria Al Squero. 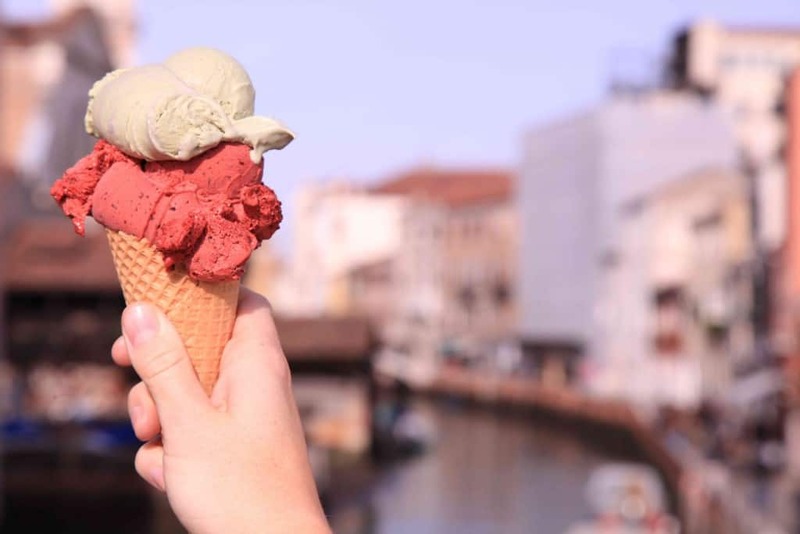 It’s been open since 1937 and serves up some of Venice’s best gelato. On a hot day, it’s really hard to beat gelato by the waterfront. 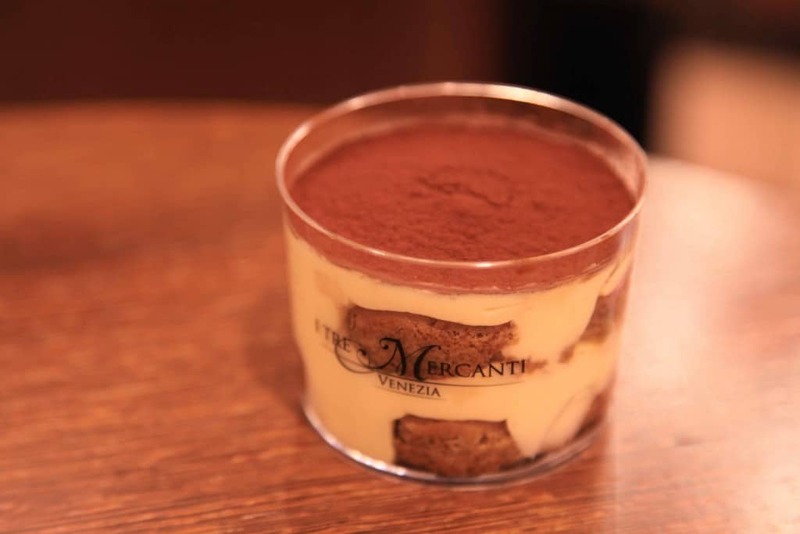 For the best tiramisu in the city head to Tre Mercanti. A lovely specialty shop with a decadent collection of original tiramisus, macaroons, and wine. Standing room only so don’t come with sore feet from walking all day. We’ve made three trips to Tre Mercanti now and it’s been worth it every time. A Spritz Veneziano is a wine-based cocktail served as an aperitif in Northeast Italy. You can’t miss the endless signs for them around Venice. Our favorite Spritz was located at Bacareto Da Lele for a mere €1.50. It’s the most positively Venice things to do and we couldn’t imagine a day in Venice without one. 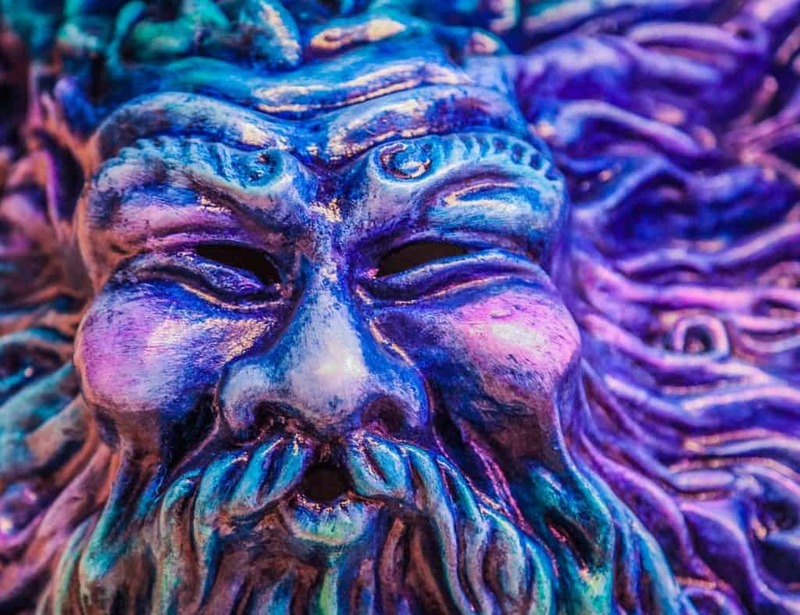 There are only a few shops left in Venice that craft true Venetian masks. We shared Ca’Macana earlier in this post, but don’t be fooled into buying the cheap knock-offs you’ll find around the city. Most of them are imported from China and far from the real thing which only encourages the death of a beautiful art form. If it’s cheap you know it’s not real. The same goes for Murano glass! The summer is our least favorite time to travel almost anywhere in the world. Venice is the shining example of why we avoid these months and it’s why the city gets a bad rap. In the summer the heat arrives and so do millions of other tourists venturing around Europe. The heat brings mosquitos and awful smells from the older sewer system incapable of handling the massive number of tourists. To make matters worse you’ll find long lines for museums and popular restaurants while paying more for accommodation and tours. We recommend visiting in late September, October, February, March, and April for the best experience. Venice is her best before the crowds. Personally, I love getting up and seeing Italian cities come to life as the sun rises. It will start to get busy through the Venice streets by 10am, and those crowds will stick around till after nightfall. 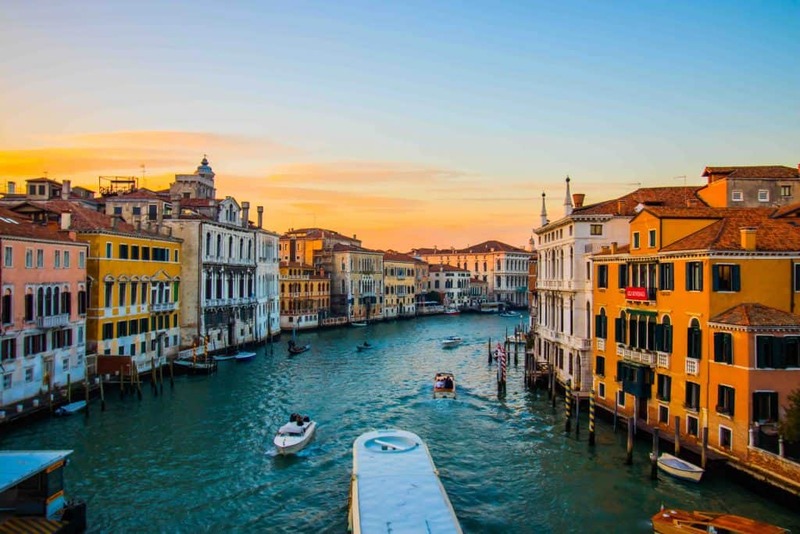 Venice is a sprawling museum with centuries of history, art, and architecture to give one day to the city is a shame. You should at the very least spend the one night in the city to allow yourself an evening to explore Venice. Eating pizza in Venice is discouraged, as wood-fired ovens are banned from the island. This is key in creating a great pizza, but with no proper pizza ovens, we’ll give the Italian staple a skip in Venice. If you want a real Italian pizza you’ll need to head to the city of Naples on your Italian tour. There. are. so. many. bad. restaurants. in Venice. Full stop. Venice has never been part of the “amazing world-renowned food” clump that the rest of Italy is in. That’s not to say you can’t get good food out in Venice, just recognize the signs of bad touristy places. Is an employee waiting outside the restaurant calling people in? Is the menu in 20 different languages? Do your research, ask around, and look at reviews before choosing a place to eat. I also like to look at menus before I commit to sitting down so I know the prices, as Venice can get very expensive. I’m only placing this in here because of my sister (Hi Kelsey). Despite my warnings, she still went to a touristic candy shop in Venice. €10 later and a light bag of bad gummies she admitted she may have made a mistake. Riding in a gondola while a gentle Italian sings you sweet nothings through the Venice canals is definitely a bucket list item. Just be aware that gondola rides cost €80 – per half hour! Well, he will cost extra as well. If you do decide to enjoy a gondola ride in Venice, just be sure you actually enjoying it. About 80% of the people I see the gondolas are on their phones either Instagramming, taking countless photos, or just browsing? Kinda pointless in my opinion. We are not big fans of cruises. I won’t lie and say that they do not seem alluring with their ease, affordability, and ability to see a number of places in a short time. However, they’re terrible for the environment and the cities that play host to their guests. 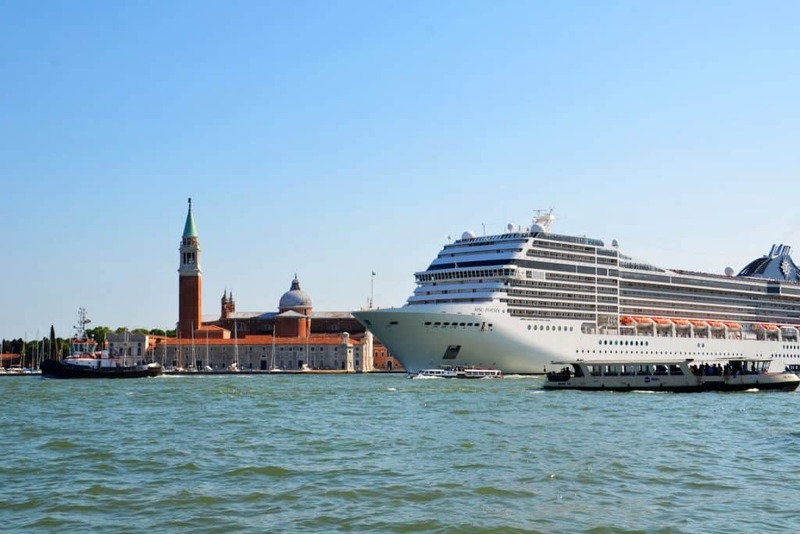 Venice and Dubrovnik are two cities who are experiencing terrible growing pains attempting to deal with the burden of cruises. To make matters worse they leave a minimal economic impact in comparison to visitors who stay in the location. We’ve stayed at a variety of places when we were in Venice. The two main options you have are Airbnb or a hotel. We’ve stayed in both and loved each experience. Airbnb allows us to feel a little more at home while in the city. We can cook and have a living room and kitchen. We were in Venice with family on one occasion and a large apartment in the center of town was suitable for five people, when a hotel would not have been. Check out a few of our first timer Airbnb tips here. Here’s $20 off your first booking. The Gritti Palace: A Luxury Collection Hotel and easily one of the nicest properties in Venice. Yes, it is crazy expensive and is one of those once in a lifetime property. But it overlooks the Grand Canal so does it really get any better? Hotel Antico Doga: This is a 12th century property just 300 meters from Rialto Bridge. It’s not as fancy or expensive as Gritti Palace, but it’s still one of the best and highest rated properties in the city at an affordable price. B&B Art Dreams Venezia: This is the first place we stayed on our first trip to Venice. It was affordable, comfortable, and had a fantastic location. Great for those on a budget. Make sure to find out what to wear in Italy. Rent a car in Venice: Compare car rental prices here. Travel Insurance: We never travel without travel insurance with World Nomads.